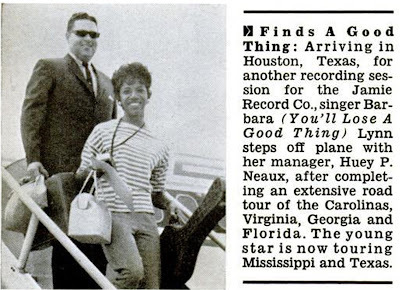 This is a great snapshot of Barbara Lynn and Heuy Meaux getting off an airplane. If you haven't already picked it up, go out and get the double disc they just put out titled "The Jamie Singles Collection, 1962-1965". It contains 32 top-notch tracks and includes her biggest hit, "You'll Lose a Good Thing".